The flight tickets to the main Russian resorts can get cheaper to 10 per cent in average. The Federal Tourism Agency agreed with the Group of Companies Aerofuels refueling airplanes of more than 100 Russian airlines, including the largest ones, upon discounts to fuel, as Rossiyskaya Gazeta was told in the agency. Oleg Safonov, the RF Federal Tourism Agency Head, taking part in The St.Petersburg international economic forum-2015, told that the respective document had been already signed. "Fuel cost share is approximately 60-70 per cent of the flight ticket total price. The discount will allow to make air traveling to the Russian resorts cheaper”, - Irina Schegol’kova, the Federal Tourism Agency press-secretary, remarked. Vladimir Spiridonov, the Group of Companies Aerofuels General Director, who also participates in the forum, explained when speaking to Rossiyskaya Gazeta correspondent that the Group of Companies and the Federal Tourism Agency have signed the Memorandum on cooperation in the field of tourism. "We will grant fuel 15 per cent discount to the Russian airlines transporting people to the domestic resorts - for example, from Kurgan to Petropavlovsk-Kamchatsky or from Perm to Sochi. Besides, in the list there is Krasnodar territory, Crimea, Far East regions, Vladivostok, in particular, and the Siberia regions at the lake Baikal – Irkutsk, Ulan-Ude”, - Vladimir Spiridonov said. He remarked that at the moment he spoke about tens of resort territories, but in the future this list can be enlarged. The international economic forum (SPIEF), the unique annual event in the world of economy and business, is held in Saint-Petersburg from June 18th to 20th. SPIEF has been held since 1997, and since 2005 the President of the Russian Federation has been taking part in this event. This year several thousand of the political and business circles representatives from 114 countries arrive at the forum. Heads of the States and the political leaders, Chairmen of the Governments, Vice-Presidents, Ministers, Governors, leading scientists, the largest Russian and international companies, mass media representatives and public members from all over the world make the main audience of the forum. On June 18th, the first working day, O.P.Safonov, the RF Federal Tourism Agency Head, met with V.A.Spiridonov, the Group of Companies Aerofuels General Director, and they signed the Memorandum on cooperation in the field of tourism. On June 10th, 2015 Nizhny Novgorod administration authorities hold the winners of the city annual competition “The best investment project of Nizhny Novgorod 2-14” awarding ceremony. 62 implemented investment projects took part in the competition, six of which were recognized the best in different nominations. The investment project ”Aviation refueling complex” of Aerofuels Nizhny Novgorod LLC was recognized the leading in the nomination “The best investment project in the field of the commercial real estate”. The company was awarded with the diploma and the memorial sign. From May 14th to 16th the ice hockey tournament Riga Cup 2015 among nonprofessional teams, now very popular in Europe, was held in Riga. Founded in 2011 Riga Cup today is one the largest European competitions, and this event is attracting more and more participants every year. For example, last year 13 teams came to Riga, and in May 2015 - 20 teams from 8 countries: Russia, Finland, Sweden, Canada, the USA, Switzerland, Belarus and Latvia. Aerofuels hockey team reached final games in tough struggle – they won 5 times and lost to the experienced team from Sweden Alk Hockey Stars in the final match, having become the silver cup winner. The Group of Companies Aerofuels would like to congratulate cordially their colleagues and friends on this victory, to wish new success and unforgettable sports celebrations! Nizhny Novgorod administration authorities published the results of the annual city competition «The best investment project of Nizhny Novgorod». Aerofuels investment project “Construction of the aviation refueling complex” was recognized one of the competition winners with regard to appraisal of the characteristics presented by the competition participants as per the criteria common for all nominations. In early June this year Nizhny Novgorod administration authorities will hold a summation solemn ceremony during which the city administration head Mr. O.A.Kondrashov will present awards to the companies-winners. Construction of the alternative refueling complex (TZK) belonging to the Group of Companies Aerofuels in Nizhny Novgorod airport was successfully completed in late 2014, and in January 2015 TZK started jet fuel refueling. The new TZK, of 10900 m3, capacity contains a complex of administration buildings and constructions, the fuel loading station, their own railroad sidetrack and the loading rack for six rail tank cars, and possesses the jet fuel supply conformity certificate and all necessary licenses. The refueling complex Aerofuels Kamchatka-Yuzhno-Sakhalinsk (a member of the Group of companies Aerofuels) has started refueling regular flights of JSC Aeroflot-Russian Airlines in Khomutovo airport (Yuzhno-Sakhalinsk) since April 01st. TZK has been operating in the airport since August 2014; it obtains the modern storage depot of aviation fuels and its own quality laboratory, as well as new refuelers and qualified personnel. The company offers services conforming to the highest Russian and international aviation requirements, and it possesses all required certificates and licenses for refueling activity. At the present time TZK Aerofuels Kamchatka – Yuzhno-Sakhalinsk refuels not only Aeroflot flights but also S7 (Sibir airline) and the international airlines charter flights. Operation of the alternative modern TZK in Yuzhno-Sakhalinsk international airport and expansion of cooperation with air carriers will lead even today, without doubt, to the passenger flow growth in the region at the expense of maintaining competition among aviation fuel suppliers in the airport and directly associated air services cost reduction. The Federal Air Transport Agency issued the Certificate of Conformance to the aviation fuels storage depot in Pulkovo airport (Saint-Petersburg) belonging to Shell&Aerofuels CJSC. The depot is located inside the airport limits and provides 100 m3/hour fuel supply to the refuelers for driving to the apron. Such capacity makes it possible to refuel any type of the aircraft on-time, including AN-124 and Boing-747. Obviously, the new storage depot construction completed in the end of 2014 (total volume of investments made over 450 million rubles) and timely performed certification procedures and commissioning will have a positive effect upon development of competition in the airport, service level growth, and upon aviation fuel cost reduction and airlines expenses decrease. One of the results of Shell&Aerofuels company work upon the alternative TZK in Pulkovo airport provision with the modern equipment will be a significant growth of the airport attractiveness, and that makes the company confident in expecting new customers and refueling volume growth in 2015. Shell&Aerofuels CJSC is a joint venture of Aerofuels Group and ShellAviation – a world leader in the field of aviation fuel supply. The company obtains not only their own storage depot of aviation fuels but also a new fleet of refuelers conforming to the Russian and international requirements, and the highly qualified personnel. Shell&Aerofuels has got all required certificates issued by the Federal Air Transport Agency for operations in the airport of Saint-Petersburg; it is regularly inspected and confirms a high quality of the offered services and absolute conformance of the aircrafts to ShellAviation standards. Fuel supplied to the aircrafts tanks is the most thoroughly inspected in the aviation fuels quality control laboratory. At the present time the company customers in the airport of Saint-Petersburg are large Russian and international air carriers. In January 2015 AEROFUELS Nizhny Novgorod (the Group of Companies Aerofuels) as one of the refueling companies represented in Nizhny Novgorod airport (Strigino), took part in procurement tender on 5000 tons of jet kero supply to Strigino airport in 2015, which was put out by one of the largest government institutions. Bidding process within the tender framework was held with the electronic trading platform. AEROFUELS Nizhny Novgorod company active participation in the tender resulted in jet kero cost fall to 25% and the tender final contract amount reduction from 192 to 141 million rubles. «Appearance of competing environment in the airport (and that is one of the main goals set by Aerofuels when launching alternative TZK in Russia) has a favorable effect upon all concerned parties’ performance: both government institutions and private companies. Thus, an illustrative example of the healthy competition positive effect is participation of our daughter subdivision recently founded in Strigino airport in the procurement tender on a large volume of jet kero supply for the state company flights refueling, in the result of which budget has saved over 50 million rubles”, - Vladimir Spiridonov, the Group of Companies Aerofuels General Director, commented upon the tender. Building of the alternative refueling complex (TZK), belonging to the Group of companies Aerofuels, in Nizhny Novgorod airport was successfully completed in the end of 2014, and in January 2015 TZK started jet kero refueling. The new TZK designed for 10900 m3 consists of a complex of administration buildings and constructions, fuel loading point and their own railroad sidetrack and loading rack per six rail tank cars, as well as all required licenses and aviation fuel supply certificates of conformance. As of 2014 results the total volume of aviation fuel used by the Group of Companies Aerofuels in Russian and abroad exceeds 700 thousand tons. 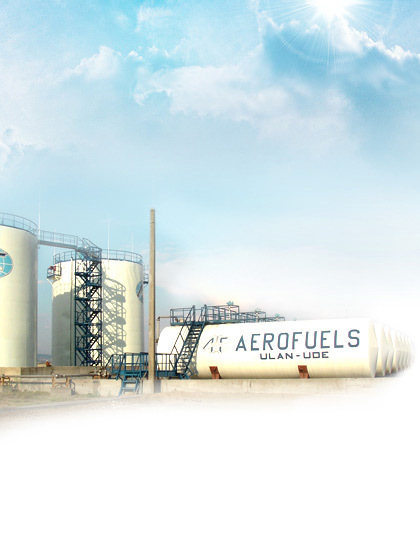 At the present time Aerofuels provides the Russian and international airlines with jet kero in 30 Russian airports and in over 1000 international airports. During the year investments in the airport infrastructure and equipment of the refueling complexes (TZK) have grown; growth made 30% to the invested funds of 2013. One of the examples of the successful implementation of the company investment policy is purchase and delivery to different TZK of new airdrome refuellers based on Volvo and compliant with all modern Russian and international requirements to aircraft refueling. More than 180 million rubles were invested in purchase of new refuellers in 2014. They have a number of advantageous characteristics making possible to refuel airplanes in compliance with IATA standards, Airbus and Boing manufacturers’ requirements, as well as the Russian aviation industry. The orders were placed in the Russian enterprises which products proved their worth in different operation and climatic conditions in the Russian airports. All refuellers are equipped with the reliable components of the domestic and foreign manufacture. On January 05th, 2015, a new Aerofuels refueling complex started working in Nizhny Novgorod airport with the first refueling of the Orenburzhje airline regular flight. In the end of 2014 the Group of companies Aerofuels successfully and in full scope fulfilled their obligations in building the refueling complex (TZK) in Nizhny Novgorod, as well as construction of a railroad sidetrack to adjoin Petryaevka railway station of Gor’ky railway line. The total amount of investments in TZK construction, as well as infrastructure development in Nizhny Novgorod airport was more than 700 million rubles. The planned payoff period of the investment program is 5 years. As Vladimir Spiridonov, the Group of Companies Aerofuels General Director, said, “Launching of the alternative TZK in Nizhny Novgorod, one of the biggest business and tourist centres in Russia, will mean a further intensive development of this key important transport hub. Besides, in the present, not simple economic situation it is undoubtedly important that appearance of the alternative TZK offers to the domestic air carriers possibility to make refueling with high quality certified jet kero at most beneficial prices, due to which the airlines get possibility to reduce air-tickets price, thus attracting new passengers to their flights and, finally, increasing passenger flow in the airport”. The new TZK designed for 10900 m3 consists of a complex of administration buildings and constructions, fuel loading point and their own railroad sidetrack and loading rack per six rail tank cars, as well as TZK has all required licenses and aviation fuel supply certificates of conformance. How much have Aerofuels fuel sales increased to in 2014? Our company specializes in the Russian and the international airlines aircrafts refueling in Russia and abroad. We have been in the market for 19 years. One can tell that we are one of its old-timers. Aerofuels is known not only in Russia but also in 150 countries. We deal with the Russian airlines and the leading international aviation carriers like British Airways, Lufthansa, Finnair, Emirates, Etihad Airways. That is practically all of fifty top airlines. This year the total volume of refuels will come to approximately 800 thousand tons with into-plane fueling. The refueling volume is shared about 50:50 by the Russian airports and the international ones. Growth will make about 8—9% of the volume in 2013. We are generally satisfied with this figure. It is achieved, first of all, thanks to the flights geography and the Russian airlines passenger turnover development. Before this September – October passenger traffic growth in Russia made from 13 to 14% from month to month in comparison with the previous year. Unfortunately, in October the growth fell a little and now it is about 6%. This is connected with ruble volatility, negative tendencies in economy. But nevertheless, this year the Russian aviation carriers will keep a good growth. If to look through the history, the Russian airlines passenger traffic has been increasing permanently since 1999 — in average to more than 10% annually. The only exception is 2009 when we saw decrease connected with the previous crisis. To continue development of airlines network service program in Russia Aerofuels has started to refuel air carriers in the airport of Izhevsk from December 17th, 2014. This event is the result of a big and intensive work started by the Group of Companies Aerofuels this spring based on the results of negotiations with the Udmurt Republic Head Mr A.V.Solovjev, in the course of which the Group of Companies took on obligations to launch a new TZK in the airport before the end of 2014. The first customer was Izhavia airline, the major consumer of fuel in the airport of Izhevsk. Into-plane fueling is performed by the Izhevsk branch of Aerofuels Perm company which possesses their own modern refueling facilities and the skilled personnel. TZK has the aviation fuel supply certificate of conformity issued by the Federal Air Transport Agency. Like in all other airports where there is the Aerofuels network, the customers are guaranteed to have refueling with the certified jet kero that passed all necessary laboratory tests and inspections by the equipment satisfying all standards. On December 08th, 2014, the Ministry of the investment policy of the Nizhny Novgorod region and AEROFUELS Nizhny Novgorod, LLC signed the Agreement on results of the investment project implementation №195 dated 06.10.2008 , which officially stated the parties’ fulfillment of obligations under the project. Aerofuels successfully and in full scope fulfilled their obligations in building the refueling complex (TZK) in Nizhny Novgorod, as well as construction of a railroad sidetrack to adjoin Petryaevka railway station of Gor’ky railway line. Aerofuels Group, LLC invested more than 700 million rubles into TZK construction and infrastructure development in Nizhny Novgorod airport. To implement a large-scale and complicated project a significant contribution and support was made by Nizhny Novgorod Governor Valery Pavlinovich Shantsev and the Region Ministry of investment policy. “We are sure that the new TZK construction means starting of a long and fruitful cooperation of Group of companies Aerofuels and the Nizhny Novgorod region. TZK operation will make it possible to reduce jet fuel cost in Strigino airport and will give additional possibility for airlines to perform flights and to expand flights geography in Russia”, - Vladimir Spiridonov, Group of Companies Aerofuels General Director, commented upon the Agreement signing. In the annual rating of the largest companies of Russia «Expert-400», published in October, Group of companies Aerofuels ranked 307. The main parameter for rating is the annual volume of products and services sales. In 2013 году Group of companies Aerofuels profit was 26 027 million rubles, and rate of growth in relation to the previous period is 15,5%. Growth dynamics significantly outruns an average value of the companies included into the rating. 400 largest companies in 2013 increased profit only to 10,5%. The main goal of «Expert-400» project is to reveal large companies of the Russian economic life and to analyze a role of large business in the economic development of Russia on the basis of their business activity results, as well as structure and main tendencies of large business development. The rating helps to increase the Russian economics transparency and thus supports its activation, establishment of partnership relations and investments inflow. Today «Expert-400» rating is the most representative list of the leading Russian companies. Over the years of its existence the rating has won recognition in Russia and outside its territory, and is widely quoted by the Russian and international mass media. Group of companies Aerofuels has completely renovated the refuelers fleet. Group of companies Aerofuels acquired two new refuelers TZA 15+15 for the refueling complex in Kemerovo airport. Investments made 45 million rubles. The trucks have already arrived at the airport and commenced refueling. Тhe refuelers are a recent development of the domestic manufacturer. They are made on the basis of the last generation Volvo truck. To manufacture the TZA components of the leading European companies were used. The pressure control system of fuel supplied into-plane will make it possible to avoid hydraulic impacts in the fuel tanks, which modern airplanes of foreign manufacture are especially sensitive to. High productivity - 750 l/min with one hose or 1500 l/min with two hoses will allow reduction of aircrafts refueling time, which will help to shorten an airplane service time in Kemerovo airport, and, consequently, will increase an aircraft turnaround really saving the company funds. «We are happy that Kemerovo airport TZK being a part of the group of companies Aerofuels network, goes on developing and offering the customers a higher level of service. Everybody will gain by that – we, the airport , on which apron a new modern machinery appears, and, surely, airlines and passengers. As soon as new refuelers arrived, aviation fuel supply service in the International Airport of Kemerovo is being rendered at the level satisfying the highest international standards », - Dmitry Kovalenko, Kemerovo airport TZK Director, commented.